The light airy cottage design of the Lulu Panel Bedroom Set from Signature Design by Ashley features a replicated white paint finish flowing beautifully over the grooved panels and embossed bead framing to make this innovative furniture an inviting addition to any child’s bedroom. Rolling trundle storage box enables the option of storage or bed. Innovative desk attachment for media chest. 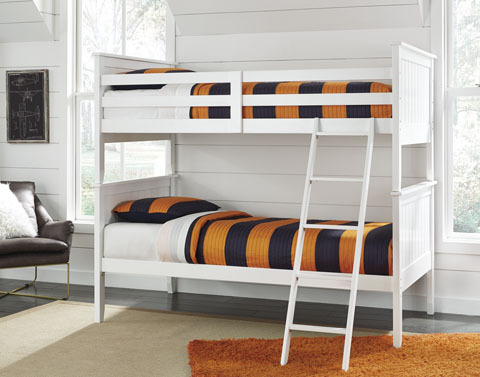 Bed is available in Twin & Full Sizes. Of all the furniture stores in Sevierville, TN , Ogle Furniture has the best selection of the SIGNATURE ASHLEY-Item Series #: B102 BEDROOM SET. This item may also come in various sizes, styles, or colors. Please ask one of our representatives if we have the specific color/style you are looking for.